Named after Virginian statesman Richard Bland, RBC was established in 1960 by the Virginia General Assembly as a branch of the College of William and Mary and was once under the umbrella of "the Colleges of William and Mary". Though self-functioning, Richard Bland College is governed by William and Mary's Board of Visitors. The College was named for the Virginia statesman and champion of public rights, Richard Bland. Son and grandson of successful planters, Richard Bland was educated at The College of William and Mary. From 1742 until his death in 1776, he represented the area in which the College is now located, first in the House of Burgesses, and later, with the adoption of a state constitution, in the House of Delegates. He also served as a delegate from Virginia in both the First and Second Continental Congresses. Before the Civil War, the property on which the College is now located was a plantation owned by the Gurley family. It became an important part of the Union-occupied territory during the 1864-1865 Siege of Petersburg. The present campus was the scene of two battles during that campaign. Shortly before the turn of the century, the Hatcher-Seward family established a dairy and cattle farm on the former Gurley property and constructed two farmhouses. Today they serve as the President’s residence and the Hospitality House. In the early 1900s, the still-beautiful grove of pecan trees was planted. The farm was used as a work camp for about twenty conscientious objectors during World War I. The Commonwealth of Virginia authorized Central State Hospital to purchase the land in 1932 for use as the Petersburg Training School and Hospital for African-American Youth. That institution was moved in 1959, and the land, still owned by the Commonwealth, became the location for the establishment of Richard Bland College of The College of William and Mary. Under the guidance of Colonel (Ret.) James M. Carson, the former hospital and training facility was transformed into Richard Bland College, and classes were held beginning in 1961. In the late 1960s, Ernst Hall (named for a local business leader influential in the establishment of the college) was added to the original campus. In addition, a Student Center Library building and a gymnasium also were constructed in the early 1970s. Colonel Carson retired as the founding President of the College in 1973. From 1973 through 1975, Dr. Cornelius Laban, Professor of Biology, Emeritus, served as the Acting President of Richard Bland College. In 1975, Dr. Clarence Maze succeeded Colonel Carson as Richard Bland College’s second President. During his tenure, Richard Bland College expanded its academic programs, added an Asian water garden that was designed by Dr. Maze and expanded international programs and travel. In recognition of his service to the College, the renovated administration building was named Maze Hall upon his retirement in 1996. In 1996, Dr. James B. McNeer succeeded Dr. Clarence Maze as Richard Bland College’s third President. Dr. McNeer introduced a residential life program and oversaw the addition of the Residential Village in 2008. The Residential Village was comprised of two dormitories, Freedom Hall and Patriot Hall, which housed 250 students. 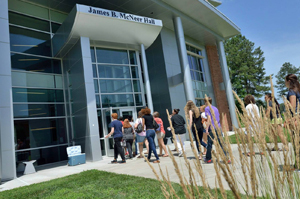 A new Science and Technology Building was added in 2010, and in recognition of his service to the College, this building was named James B. McNeer Hall. Dr. McNeer retired in 2012. In 2012, Dr. Debbie L. Sydow succeeded Dr. James McNeer as Richard Bland College’s fourth president. She is president emerita and distinguished professor of English at Onondaga Community College—one of the largest community colleges in the State University of New York (SUNY) system. Sydow has served as President of the New York Community College Association of Presidents, Chair of the Board of Directors of the Institute for Community College Development at Cornell University, and Chair of the American Council on Education’s Commission on Leadership and Institutional Effectiveness.